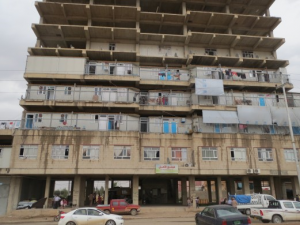 (Erbil, Iraq) Dozens of skeletons of large multi-story buildings rising above the streets in Ankawa and Erbil, Iraq, are now home to Christians fleeing the Islamic State. Not so long ago construction was booming in the Erbil area, which was declared the No. 1 tourist destination in the Middle East in 2014. Then suddenly, the Islamic State captured Mosul to the west and advanced to within 35 kilometers (15 miles) of Erbil. Construction immediately stopped on a dozen five-star hotels, as all international flights into the huge airport were suspended. The shells of those unfinished hotels are now centers for Internally Displaced Persons (IDPs). During a visit to the area in September, I was shocked to see the modular rooms that had been set up on the empty floors of one of these skeletal building. The stairs are bare, rough cement, and of course there are no elevators for those living there. Children play where they can, and dozens were on the stairs as I climbed with a mission team to examine living areas. The modular units provide one room per family. There is no privacy for the adults, and washrooms and toilets are located in common areas. For some individuality, the public kitchens have dozens of propane stoves so women can cook for their own families. The conditions are sanitary but certainly not comfortable. This building was one of the sites that had been chosen by local ministries to expand the Christmas for Refugees program, and was the reason for my visit. On an upper floor a combination education, worship and meeting hall had been constructed out of partitions by a Christian organization. That would be one of the centers for the Christmas program for refugee children. In this and other IDP centers I visited, most families considered themselves fortunate because 90 percent still had the men present. Husbands and fathers of the other 10 percent had been killed by the Islamic State or were missing and presumed dead in ISIS-held territory. Al-Amal Hope Center for the Displaced People of Nineveh is the official name of the building above. The owner gave up his plans to open the building as a hotel in sight of the airport and allowed it to be used as a refugee center. The building itself is actually located in Ankawa, a majority-Christian municipality adjacent to Erbil. The Kurdish military, known as the Peshmerga, has pushed the Islamic State back to 25 miles from the city, allowing flights to once again arrive and depart from the airport in Erbil served by Royal Jordanian Airlines and other carriers. The Iraqi army refuses to defend the Kurdish areas despite the fact that most Iraqi oil is pumped from there. The oil flows to southern Iraq, where the Iraqi government has refused for two years to give any of the money from the sale of the oil to the Kurds. The official position of the United States is not to allow the Kurds to sell their oil to buy weapons to protect themselves, despite the fact that the Iraqi government will not protect or arm them. Ashti is a refugee camp sanctioned by the United Nations and is also located in Ankawa. Virtually all of the residents in this caravan town are Christians, and most of the trailers have either a cross on the door or a larger one erected on the roof. Every one of the caravans or trailers are identical, but at least each has its own kitchen and bath. Most other camps have common cooking and sanitary facilities. 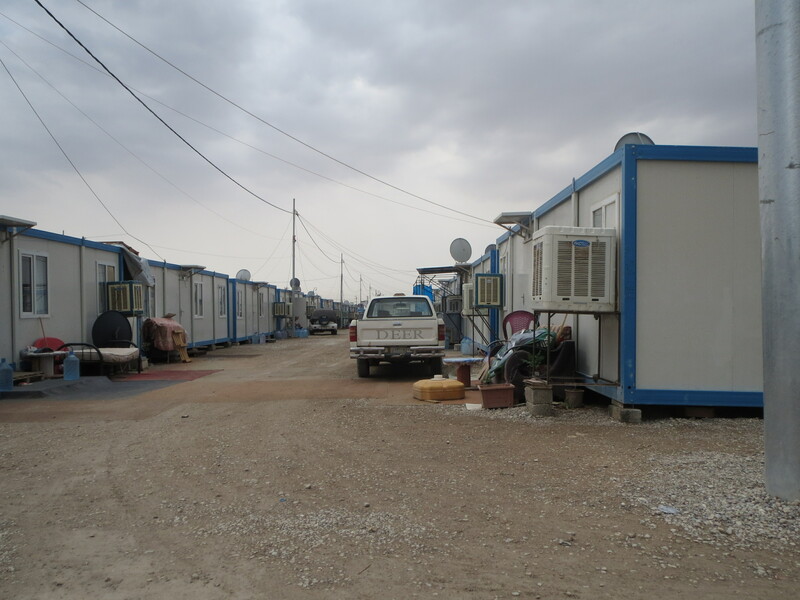 The modular homes do have air conditioning units, but the power in the camps and in the entire Kurdish area of Iraq is unreliable because of the huge population increase that was not accompanied by expanding infrastructure. On days when the temperature exceeds 100 degrees, there is power for less than 15 or 16 hours per day. During my stay in September the high was 107. Families are so crowded together that there is no privacy. Some newly arrived men in the Ashti camp had climbed onto the roofs of their trailers to sit there, just to be away from the closeness inside the camp. Some said they would be better off outside the camp because they could earn some money. Inside the camp, families are 100 percent dependent on aid. Ashti Camp was occupied by 1,057 families, totaling 6,500 people in mid-September, with more IDPs arriving daily. Over half of those in the camps are children who are not attending school. The only medical care available is at a hand-built mobile clinic furnished by a ministry. The doctor who took the responsibility of outfitting the truck received estimates of up to $600,000 to build it in Europe. The doctor and Christian ministry workers used an old Mercedes truck frame and restaurant refrigeration units, and built it for $80,000 in donations. 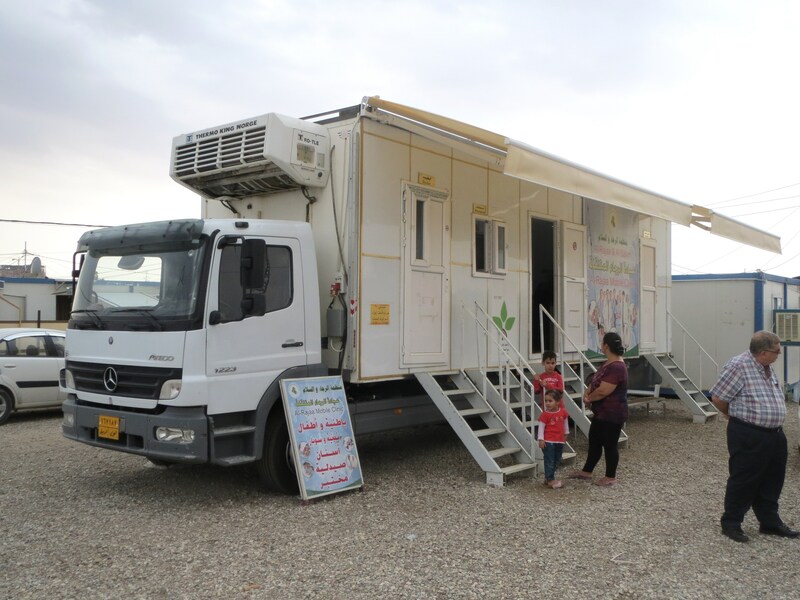 The al-Rajaa mobile clinic has a dentist, two doctors, a pharmacy and a testing lab, all on one truck frame. Iraqi Christians are doing their best to tend to their own needs. Some of the stories of the misery these families went through are heartbreaking, but still the vast majority of the families are intact, which is in itself a miracle. The tragic waste of human ability and knowledge is stunning. Both Iraq and Syria were nations with 99 percent literacy and a large middle class. Among those idled in these camps are skilled technicians, medical workers, teachers – even professors, shop owners and in one case a land developer. Now they sit watching TV while their children, who once studied in private Christian schools, play in the dirt outside their trailers. Sadly, much of this devastation can be laid at the door of the White House and its miserably failed Middle East policy. The Hillary Clinton-Barack Obama “grand strategy” of replacing secular governments in the Middle East with “moderate Islamists” did nothing more than open the door to al-Qaida and the Islamic State. Even with Clinton and her Muslim Brotherhood advisers gone, President Obama continues to push for Sunni-led governments favored by Saudi Arabia to replace those in secular nations such as Syria. The Clinton-Obama doctrine in the Middle East has cost hundreds of thousands of lives of civilians and the near total destruction of Christianity at the place of its birth. This death and destruction, not his “climate change” agenda, will be the true legacy of the Obama era.